What is the data table feature and how do I use it? The data table allows your technicians to neatly add information to a formatted table on your custom form(s), which makes for easy reading/reporting for everyone. 2. Fill in the Table Heading, Default # Rows and the Max # Rows field. Default # Rows must be >= 1. This is going to be the number of rows that appears when the table is empty and has not yet been filled out yet. Max # Rows = The maximum number of rows a tech can add to the table at any given time. 3. Click the + button in the Columns section to begin adding defined columns to your table. 4. To begin adding columns to your table, fill in the Column Name and Column Type. The available Column Types are: Checkbox, Currency, Number and Text. For example, you can see below that as the fields are being added, there is a preview of what the table will look like on the form itself. You can practice with the preview to be sure it's going to achieve your table's goal. 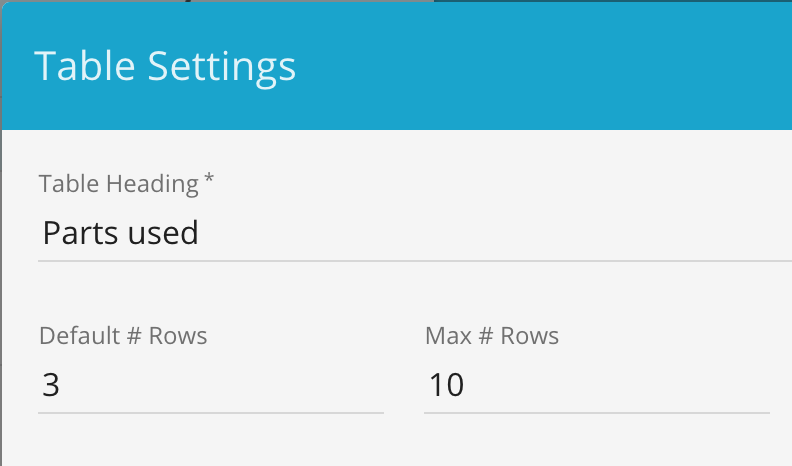 The data table gives you the ability to "Total up" an entire column. This can be done by clicking the "Show Total" checkbox when adding the column to the table. In the example above, the Price column is being totaled. This will allow you to easily see the total price of all parts used in this table. You also have the ability to calculate values directly in the table. This can be done by selecting the column you want a given column to be multiplied by from the "Multiplier" field. In the example above, each row has a Quantity and a Price field. These fields can be "multiplied" by one another to obtain a certain number. In the example, the Price field is being multiplied by the Quantity field to produce the total price of each line's parts.